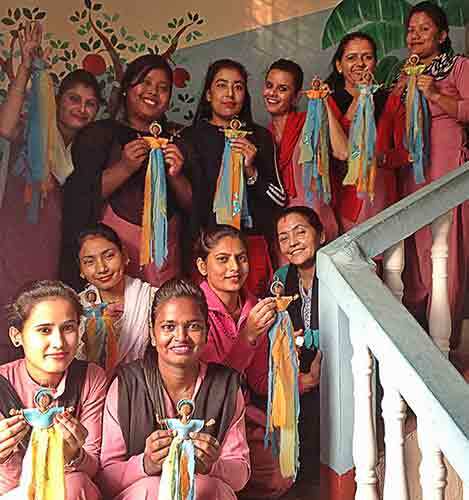 A flock of angels will flutter through PCD this spring as we raise travel funds for the 3 Samunnat women who will visit the US in October for training and market development. Gita, Pramila, and Kopila are anxious to meet face to face with those who have supported them and watched the Nepal project grow for 11 years! 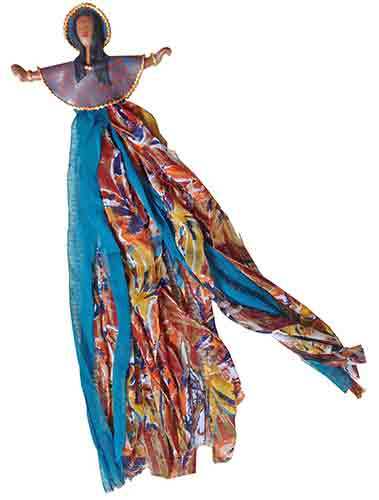 The angels are elegantly draped in repurposed sari silks. Each artist has given her celestial creation a personality, tucked a special message for you under the bodice, and folded it into a gift bag. If you’d like to support Samunnat in other ways, you can click on the Paypal donate button next to the angels in the right column on PCD and make a donation in any amount. The ladies share their excitement on Instagram. Learn about Samunnat in a nutshell here. I’ll be escorting the visitors and will talk about our plans, ask for your suggestions and help in upcoming posts. With your help, we can do this! Note: Ron’s address is correct now! On Facebook, Ponsawan Sila shares her texture trick for these playful beads. She wraps the base beads in crepe paper and gives the paper a twist to create the illusion of wrinkled fabric. Then she applies the circles of color. Whenever I’m exasperated with the rush of silly stuff online, I think of people like Ponsawan who moved from Indiana to Thailand. She stays in touch! She’s still one of the gang sharing her creative sparks with all of you. It’s good to be reminded that these connections can make our lives better. Thanks, Ponsawan. These colors, favorites of California’s Barbara Jarman, speak to us this Monday morning.The blues and purples remind us that spring violets and bright dandelions will soon burst out on the lawn. 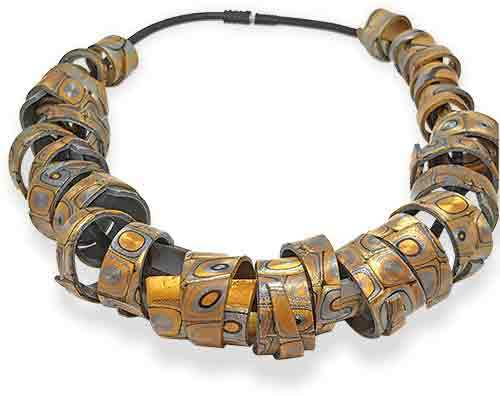 Barbara spent twenty years as a commercial artist and the last ten as a multi-media jewelry artist. How unworried and unselfconscious Barbara’s compositions are! No matchy-matchy. Nothing precious and perfect. 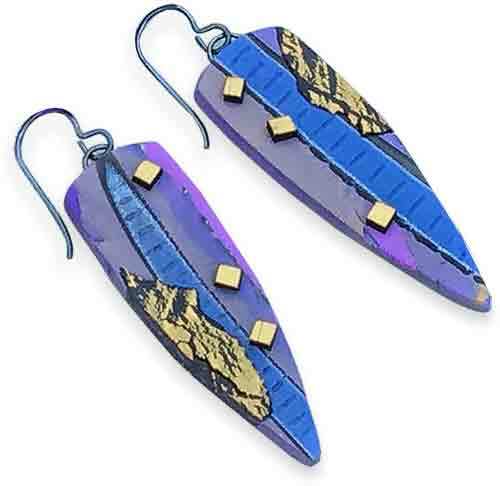 Her breezy lightweight polymer earrings are created to delight the wearer. Finding out what’s catching on, what’s trending is one good reason to attend polymer events in your area. 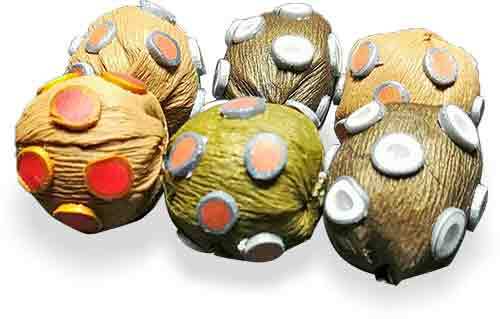 Chunky wrapped beads formed in the paper bead style and baked around varying sizes of wooden dowels popped up at Clayathon. This particularly striking one is from Gail Bor. Its free and easy style and colors look great with any wardrobe. 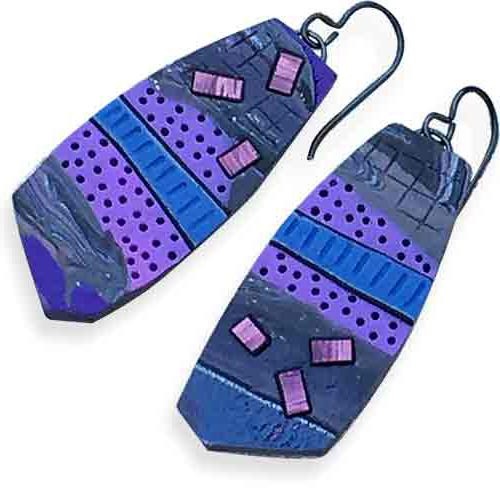 Like lots of polymer artists, Gail makes pieces to wear and doesn’t show much of her work online. Late at night, when everyone clears out of the workroom, I roam with my camera to capture works in progress. The cluttered workspaces offer great insight into each artist’s methods and thought process. In this week’s StudioMojo you can wander the conference with us and pick up new tools and ideas. Sign up now to join us for the inside scoop this Saturday. What is it that makes this detail from Helena Bogosian’s clay illustration so calming? The shapes and shades of the water are quite believable and soothing. The goldfish glide unperturbed through the water. The cat floats through the scene unaware. It all looks effortless. Helen is terrific at reducing the scene down to its essential elements for us and you can watch the steps on her Instagram. What most of us want to ask is, “How do you come up with these remarkable scenes?” Illustrators are an entirely different breed of polymer artist, don’t you agree? Another Clayathon find. 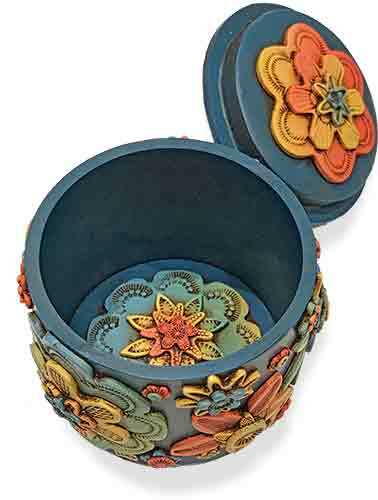 This small treasure box is from Virginia’s Lisa Haney. 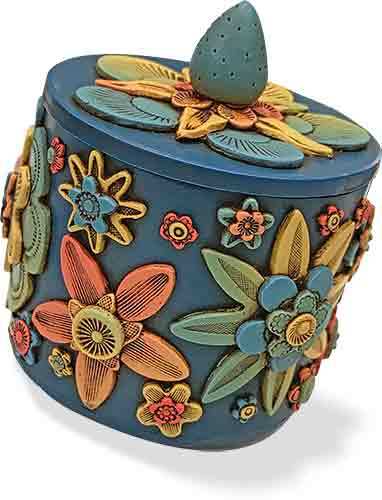 Her Skinner blended flowers stand out in colorful relief on the dark blue background and are highlighted with paint. Look inside and you’ll see the flowers repeated there. Lisa is proud of the way the lid seals tightly on the all-polymer container. No loose lid here! Lisa’s mostly on Facebook and Pinterest where she gravitates to 3D vessels and floral scenes.